Hutchison's Three UK has detailed an ambitious network and IT overhaul as it paves the ground for 5G. After being a laggard with 4G, the UK operation sees 5G as a chance to grow by jumping the competition with efficiency gains from infrastructure updates. 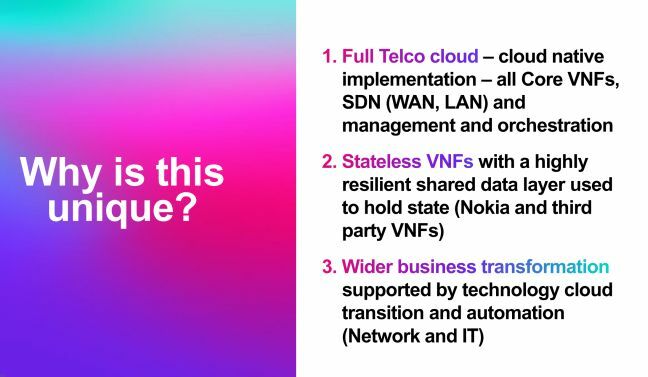 Three has virtualized both its IT operations and its RAN and core networks, and it explained how it did this yesterday. UK CEO David Dyson also hinted that 5G wouldn't be introduced at a premium – which is how EE launched LTE – but stressed that launch dates were entirely up to the availability of handsets. So far there isn't a 5G handset anywhere in the world – the closest is Verizon's Moto Mod "sled", which attaches to the back of a phone. Note the size of the battery there. So far 5G resembles previous generational mobile technology leaps, where the network equipment was ready, but the handsets weren't. "GSM", it was once joked, stood for "God Send Mobiles". As the fourth-placed MNO out of the UK's four, what Three is contemplating is radical. While the 3G operations will stay as they are – at least until 2022 – Three is virtualizing the RAN (radio access network) and the core network. It's also doing the same to IT operations, running some 80 per cent of its applications on virtualized containers in the public cloud, "a first for a telco," noted Three UK's chief operations officer Graham Baxter. The overhauls will be phased in at different times. Getting the RAN network ready means replacing base stations with bigger ones to meet the capacity and performance requirements of 5G. 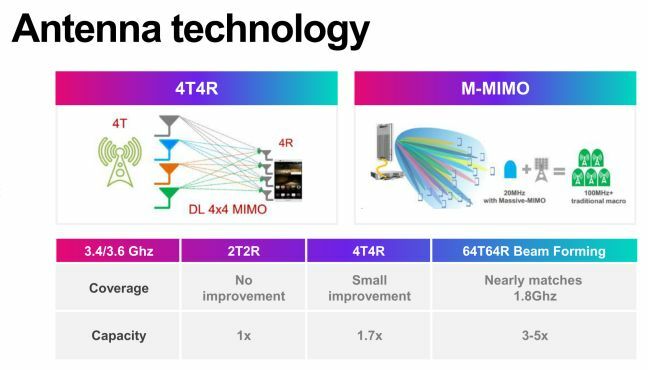 In Three's tests in Hong Kong and Austria, it found a 3x-11x capacity gain from M-MIMO, so Three UK is working on the assumption that it will be 3x-5x, Phil Sheppard, Three's director of network strategy, told analysts and press. 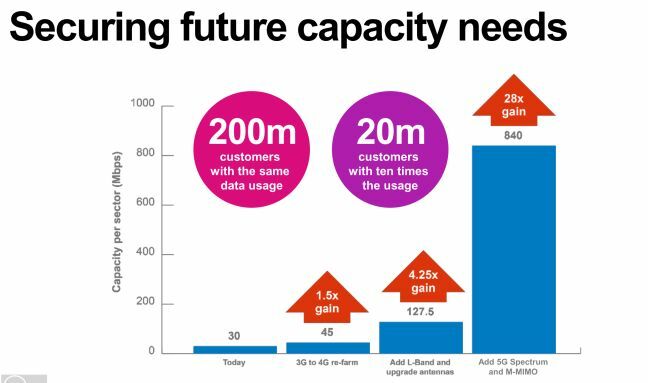 Capacity per sector should increase dramatically – up to 28x once the spectrum has been allocated, and the M-MIMO artillery is in place. Huawei is providing the guns. As a rough roadmap, Three announced a speed boost to its 4G network last week, which will be followed by spectrum refarming (using 3G for 4G), and then the introduction of carrier aggregation, and then activating 5G. The core network is also getting an overhaul. Three will move from three data centres to 20, of which 17 are already activate. Its nationwide dual-fibre ring is now live. 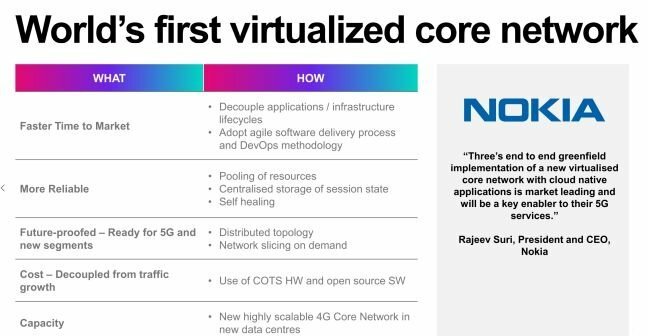 Three touted what it claims is the "world's first virtualized core network" for a telco, built with Nokia Networks' help. Three has snaffled 170 BT exchanges with 100 more to come in the long term. London's Mayfair and Soho are the test bed for this, codenamed project Montana, including trials of the sewer-based fibre we mentioned here last week. But Dyson warned that even with ingenious solutions, MNOs needed a sympathetic regulator. Firing a distress flare in Ofcom's direction, Dyson said the view in the industry "was that dealing with BT was as difficult as ever. Even when you dig your infrastructure yourself rather than rely on BT's ducts and poles. There needs to be a tight regime around SLAs so they don't make things more difficult for other people to do things they want to do themselves." Three will partner with SSE for the data centres and with O2 for the sewers. CityFibre is another partner. Three is now reasonably happy with the spectrum outlook, given that 700MHz is up for auction next year and Ofcom has agreed to offer up the 3.4GHz to 3.6GHz frequencies, with the high-capacity millimetre wave to follow in early 2020. "That means we'll have relatively doubled the spectrum in a short space of time by then," said Sheppard. "5G is a fantastic opportunity to leverage broader spectrum portfolios." Financial analysts were keener to hear whether this would eventually save Hutch money. Dyson said capital expenditure would level out at around £400m a year once the technology was in place, and the network virtualizations were complete. One opportunity was home broadband. 5G will start to encroach on the fixed-line broadband monopolies, as we noted, depending on where you live. More on that shortly. Purely by coincidence, EE announced nine 5G test sites in trendy East London yesterday – Provost Street, City Road, Central Street, Old Street, Cheapside, St Paul's, Finsbury Circus Garden, Clerkenwell Street and Bartholomew Square.